Easy application - simple to use. Effective - acids dissolve away rust. Fast, penetrative action. For effective removal of rust off steel and chrome work. N.B. Acids can effect paintwork and plastic surfaces particularly nylon. If accidental contact does occur rinse off immediately with water. 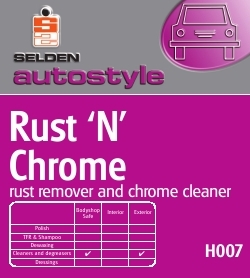 RUST 'N' CHROME is generally used undiluted. All loose rust must first be removed. Apply Rust 'n' Chrome using a brush, agitate if necessary and leave for up to 10 minutes. Rinse off with water and wipe dry. If any rust still remains repeat the process. For chrome applications treat as above then apply polish to confer lasting protection. Composition An aqueous blend of hydrochloric and phosphoric acids, inhibitors and wetting agents.